Holly Grace is an Australian artist based in Melbourne, Victoria. Grace studied at Monash University, majoring in glass with first class honors and completing her Masters of Fine Art in 2004. Since then she has exhibited in venues such as the Melbourne Art Fair, London Art Fair, Sofa Chicago, Art Taipei and has had numerous solo exhibitions both here in Australia and internationally. The artist has been collected by various public and private collections, such as the National Gallery of Australia, Parliament House Art Collection, Glas Museum Ebeltoft, the National Glass Collection, Gallery of Western Australia, and Kerry Stokes Art Collection. The artist’s recent work explores the narrative between the Australian Highlands and the romanticism of the sublime. 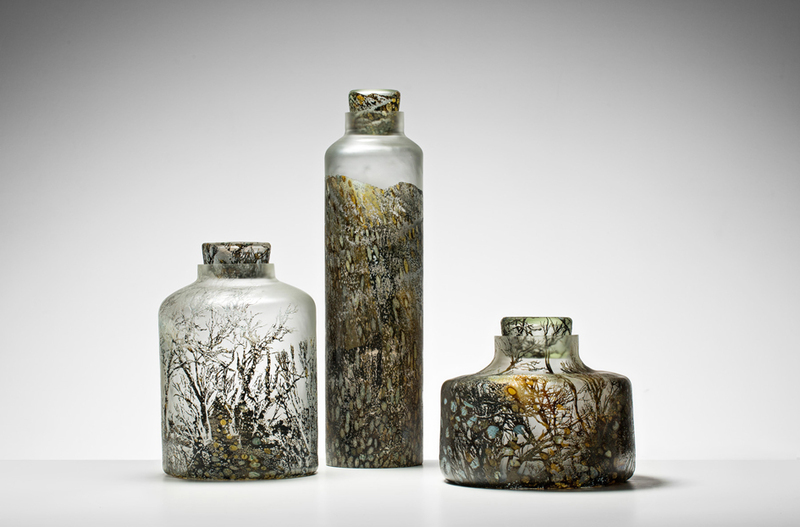 Through a photographic survey images from nature are transferred and etched into hand blown glass surfaces. Further exploration and manipulation of these surfaces reinterpret this luminous canvas and blurs the boundaries between the reality of the photograph and the imagination of the maker. Creating artwork that is a unique and personal interpretation of the Australian landscape.